Thugs of Hindostan is an upcoming 2018 Indian Hindi-language epic action-adventure film, written and directed by Vijay Krishna Acharya, and produced by Aditya Chopra under his banner Yash Raj Films. The film stars Amitabh Bachchan, Aamir Khan, Katrina Kaif, Fatima Sana Shaikh and Lloyd Owen in leading roles. Set in 1795, the film follows a band of Thugs led by Khudabaksh Azaad (Bachchan), who aspires to free Hindustan (the Indian subcontinent) from the rule of the expanding British East India Company. Alarmed, British commander John Clive (Owen) sends a small-time Thug from Awadh, Firangi Mallah (Khan), to infiltrate and counter the threat. The Movie Music was composed by Ajay-Atul and lyrics written by Amitabh Bhattacharya. Produced on a budget of ₹300 crore (US$42 million), Thugs of Hindostan is the most expensive Bollywood film. It marked the second collaboration between Khan, Acharya, and Kaif, after Dhoom 3 (2013). The shooting of the film starts on 5 June 2017 in Malta. In October, a dance sequence choreographed by Prabhu Deva and centered on Bachchan was filmed. The film was also shot in Thailand and Mehrangarh; it was put on a short hiatus after Bachchan experienced discomfort on set. Filming concluded in March 2018, the final schedule is completed in Rajasthan. Thugs of Hindostan is fixed by the Production Team to be released during the week of the Diwali festival, on 8 November 2018. The film tells a historical fiction story set in 1795 when the Indian subcontinent was known as Hindustan or Hindostan, where Indian bandits known as Thugs (from the Hindustani word “thug”). The film follows a band of Thugs led by Khudabaksh Azaad (Amitabh Bachchan), who poses a grave threat to Company rule in India as he aspires to free the country from the British. Alarmed, John Clive (Lloyd Owen), a British commander, sends Firangi Mallah (Aamir Khan), a small-time Thug from Awadh, to infiltrate and counter the threat. In September 2016, Yash Raj Films’ next project titled Thugs of Hindostan was announced and would feature Aamir Khan and Amitabh Bachchan. The lead actress was not yet finalized at the time. The film was initially titled the only Thug; it was set for a release on Diwali in 2018. Hrithik Roshan, who was initially approached with the film’s leading role, suggested some changes to the script. The film producer Aditya Chopra agreed; meanwhile, Acharya approached Khan with the script, who agreed to do the film with no changes to the storyline. Later, in November 2016, Khan also requested that the script is reworked, particularly the character of the leading actress, and put the project on hold. Meanwhile, he grew his hair and beard for his look in the film. By February 2017, Khan had prepared his look for the film. In the same month, Shraddha Kapoor gave a costume look test and audition for the film. In March 2017, it was reported that Khan suggested Fatima Sana Shaikh’s name for a role in the film; while denying rumors of casting, Sheikh expressed her eagerness to work in the project. In May 2017, Shaikh was confirmed to play a role in the film, with her audition look being revealed. She replaced Kapoor. Kaif was confirmed to star in the film on Yash Raj Films’ official website. Khan, Bachchan, and Acharya met during the month of May to discuss script changes. In June 2017, Khan denied rumors of Thugs of Hindostan being inspired by Pirates of the Caribbean, stating they are both simply action-adventure productions. Thugs of Hindostan is Khan’s second time collaborating with Vijay Krishna Acharya and Katrina Kaif, after Dhoom 3 (2013). It also marked the first collaboration between Khan and Bachchan. Bachchan and Khan were supposed to star together in the Indra Kumar-directorial Rishta, planned during the late 1990s, but the project was shelved. Besides Roshan, Jackie Shroff, Alia Bhatt, and Deepika Padukone were to be a part of the film but turned down the role. Contrary to initial reports, the film is not based on Philip Meadows Taylor’s 1839 novel Confessions of a Thug; the film tells a fictional story based on historical events. Acharya links the misunderstanding to the word thug appearing in both works. For his look, Khan also underwent permanent ear and nose piercing. 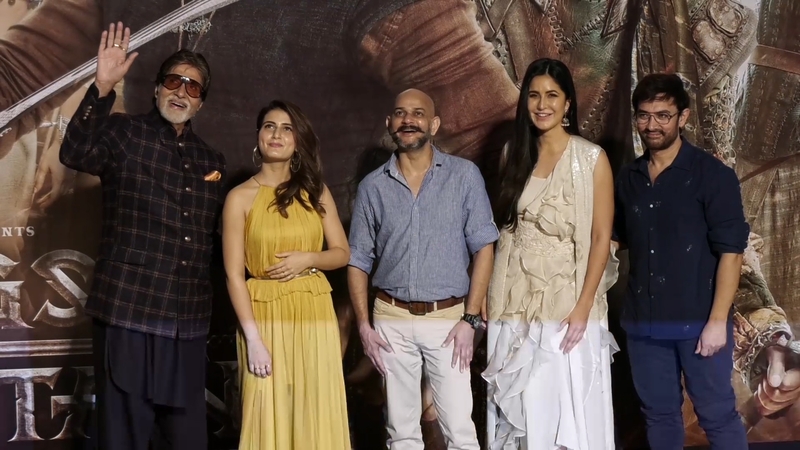 In making Thugs of Hindostan, Acharya wanted to give a twist to period drama films and thus made what he considered “an irreverent film which has a chapter that is not very noble”. He made the film a visual “spectacle”, considering the difficulty in bringing audiences to theatres. Khan said his character was someone “who cannot be trusted at all – [so it’s the] very opposite of Dangal … He’s a very slippery character.” Katrina Kaif reveals that she does not do much action in the previous film, in particular, Tiger Zinda Hai (2017). Bachchan wore iron armor for playing his character, the second time he did so after his 1998 film Shahenshah. In addition, he also wore a pagri, grew long hair and learned sword-fighting. Most of Bachchan’s action sequences were situated in rainy settings. Thugs of Hindostan‘s production budget is ₹3 billion (US$42 million), making it the most expensive Bollywood film. It was initially planned to be produced on a budget of ₹900 million, but the budget was overshot while filming. Filming commenced on 5 June 2017 in Malta. Two ships were constructed in Malta for the purpose of filming; shooting was heavily guarded to prevent leaks from sets. The ships were built by over 1000 people working together and weighed 200,000 kg each. By 28 June 2017, Bachchan finished filming his first schedule in Malta. In middle July, Khan took a break from filming and went on a vacation to Italy. Mehrangarh Fort, situated in Rajasthan, where a large portion of sequences was filmed. Chopra, who was not impressed with the film’s action sequences filmed in Malta, had them filmed again in Yash Raj Films’ studio. It was reported that busy with filming for Thugs of Hindostan, Khan would be unable to promote his film Secret Superstar (2017) properly. However, in October 2017, Khan took a break from filming to promote his film. In August 2017, Bachchan fractured his rib cage while shooting, but had to continue filming since the schedule was tight. The film’s dance sequence, which featured Bachchan, among others, and choreographed by Prabhu Deva was filmed in October 2017. When filming was not taking place, the cast, along with the crew, wore face masks to avoid contracting common cold. In September 2017, photographers of the Filmfare magazine captured Khan while filming, and leaked his look. An upset Khan increased security surveillance on film sets. The same month, Bachchan’s look was also leaked online. Khan stated that “this shouldn’t have happened” and it foiled plans for later look releases. Filming also took place in Thailand, from 6 December 2017. The schedule was wrapped up on 26 December 2017. 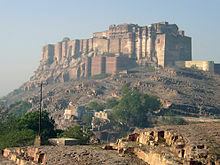 Some sequences were also shot in Mehrangarh Fort, Jodhpur. After Bachchan experienced discomfort on set, a team of doctors visited him in Jodhpur. His wife, Jaya Bachchan stated that his heavy costumes hurt his back and neck. The stunts aggravated his pre-existing neck and shoulder pain, which was a result of past injuries from stunts he did for filming in the 1970-80s. Bachchan stated that he was back to normal. The film’s shooting was put on a short hiatus as a result of his injury. He resumed filming on 13 March 2018. The film’s climax sequence was filmed in Jodhpur, Rajasthan in late March 2018. Thugs of Hindostan is scheduled to be released in Hindi, Tamil, and Telugu with 3D and IMAX formats. The Yash Raj Films’s marketing team began their promotion of the film on Monday, 17 September 2018: an official logo and title card were revealed on their YouTube channel. On 26 September, Khan and Bachchan released a promotional video which featured them speaking in Telugu and Tamil, urging native audiences to watch the film. On 27 September, Yash Raj Films’ founder Yash Chopra’s 86th birthday, the film’s trailer was released on YouTube. The trailer launch was held in Carnival Cinemas, Wadala, Mumbai, on India’s biggest IMAX screen, along with the presence of the film’s cast. The trailer crossed 30 million views on YouTube on the first day and crossed 32 million views across digital social media platforms in 24 hours. Dubbed versions were also launched in Tamil by Kamal Haasan and in Telugu by S. S. Rajamouli. It is set to be released in India during the week of the Diwali festival, on 8 November 2018. There are also plans to release the film in China, where Khan’s previous films were successful, including 3 Idiots(2009), PK (2014), Dangal (2016) and Secret Superstar (2017).